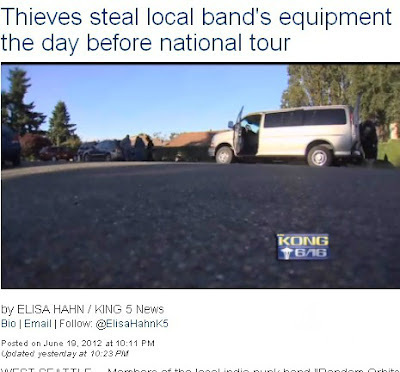 A familiar sadness fills our hearts every time we see bands posting that their gear was stolen out of their van. Nothing feels quite as violating as being stolen from. If this has never happened to you… trust me, it’s sheer dumb luck that you haven’t been a victim yet. In an age of social media where we flaunt our business to maximize exposure, advertise our thoughts and use the Facebook check-in feature to say where we are…. make no mistake about it… YOU-ARE-BEING-TARGETED (sometimes even before you get to the venue) and you’re making it easy for them. This isn’t meant to sound like a Negative-Nancy or Debbie-downer. Protect your band; protect your livelihood. Everybody loves having drinks and having a good time after a show, but someone is watching you. Even if you aren’t noticeably being watched, assume that you are. Get everybody and everything home safe so you can rock again another day. The smaller your band is, the easier it is to target you. You don’t have grips or roadies to help you load or watch your gear. Giant U-haul trailers spell out wonderful “I’m not from here” and “I’m off getting drinks” signs. Rotate babysitting duty with friends & members. If you’re going to get a smoke, smoke by your van. If you get a bad feeling, listen to it. They’re called instincts for a reason. Out-of-state license plate? Easy money. Do multiple “idiot checks/ did I forget something?” checks before leaving. Never keep anything in plain sight. Not even coins. Pin your trailer/van against walls when you park. I’ve heard of bands being stolen from while they’re grabbing fast food. Don’t rely on Good Samaritans to stop evil-doers. People now-a-days aren’t very confrontational, especially if they’re not sure what’s going on. Don’t leave anything overnight in the van. I know your tired from rocking out, but man-up and put your gear in a building. Nothing is full-proof in stopping theft, but this is your livelihood. You need to try and protect it. You can’t stop Nicholas Cage from stealing your car in 60 seconds but you can stop jerks with a screwdriver and a coat hanger from trying. By simply protecting your band and your gear, you won’t make yourself an easy target. Trust us, people don’t walk up to you and say they’re stealing from you (at least, not very often.) They wait until you’re not paying attention. Are we being paranoid? Not paranoid at all, the world is full of schmucks. I always keep an eye out for my peeps so if you feel watched, it just might be me! haha!